Hosting a successful corporate event involves careful planning and coordination and one of the most important factors to ensure your event runs to plan is sourcing the best, reliable suppliers. The Venue event planners have rounded up our Top 10 Corporate Event suppliers to cover all your needs and ensure your event is perfect from start to finish. Humphries AV are an audio visual hire and event production company based in North Liverpool. Humphries specialise in delivering incredibly successful live events and audiovisual services to corporate clients, public sector organisations and conferencing venues in Liverpool and across the UK. From concept to execution their Conference presentation and AV Rental Service can supply you with – sound, vision, lighting, staging & stage sets. Whether you wish to motivate, educate, entertain or reward your guests or delegates; Humphries have the technical expertise required to support you, & guarantee to deliver truly stunning results. Established for over 40 years, Childwall Table and Chair Hire are a true local, family-owned company based on Jamaica Street, Liverpool. Widely regarded as the supplier of choice they have grown to be one of the largest furniture hire suppliers in the North West covering Liverpool, Manchester, Wirral, Cheshire, North Wales, Lancashire and Cumbria. They supply furniture for a wide range of functions including weddings, small family occasions, large corporate and public events. One of The Venue’s firm favourites for weddings, private events and corporate functions alike, The Dutch Flower Shop is a fantastic local business that never fails to deliver. A family business with family values at its core, they go above and beyond to ensure customer satisfaction, a trait that has earned them business with many of the cities most reputable companies including the two greatest football clubs in the world and several of the city’s finest hotels. As a well-established Liverpool business, their corporate client base has grown to be as diverse as the city itself. From beautiful bouquets to full venue dressing, companies can put their faith in The Dutch Flower Shop to deliver something fresh to bring their brand to life. Having hosted many corporate events over the years The Venue have come to recommend Radisson Blu as one of our top accommodation choices based on the excellent feedback of our guests. Offering fantastic rates and top notch customer service, The Radisson Blu is the perfect choice for local accommodation central to all that Liverpool has to offer. The River Mersey Ferry Station lies adjacent to the hotel, and there are 2 train stations within 1.4 kilometres. Guests are local to all major events venues including Royal Liver Building The Venue, The Marks and Spencers Arena and the ACCL Exhibition Centre. Situated in the Baltic Triangle, Go Cre8 are a multidisciplinary design and print company providing professional services in design, print, display and new media at fair, affordable rates. Launched in December 2003 they have steadily built the foundations of a successful business and have forged successful partnerships with some of our city’s biggest local businesses and agencies. Go Cre8 have a wealth of achievements including being shortlisted for ‘Best New Business’ at Echo Enterprise Champion Awards in 2006. A definite ‘go to’ provider for a top quality service. Based just up the road from us on Water Street, Paragon offer expert printing services and a fast turnaround (perfect for those last minute jobs). Their expertise is not limited to small print. You can visit their website for a full list of services. Art of Imagination is a local, Liverpool based event photographer whose recent work includes photographing The Royal Liver Building for many of our Christmas events! As her name suggests, Art of Imagination has a fresh and imaginative approach to Corporate Event Photography and is able to strike the perfect balance between professional and personal, capturing your brand’s identity both visually and emotionally. Whilst many of our clients enjoy VIP and feeder events at the exclusive Royal Liver Building Venue, The ACCL Exhibition Centre is the perfect spot for bigger events such as large scale exhibitions and trade shows. Situated a short stroll down the Waterfront it is the perfect large scale venue to compliment our more intimate setting, especially when followed up with a Drinks Reception on our Royal Balcony! Host your delegates in Liverpool’s iconic landmark. 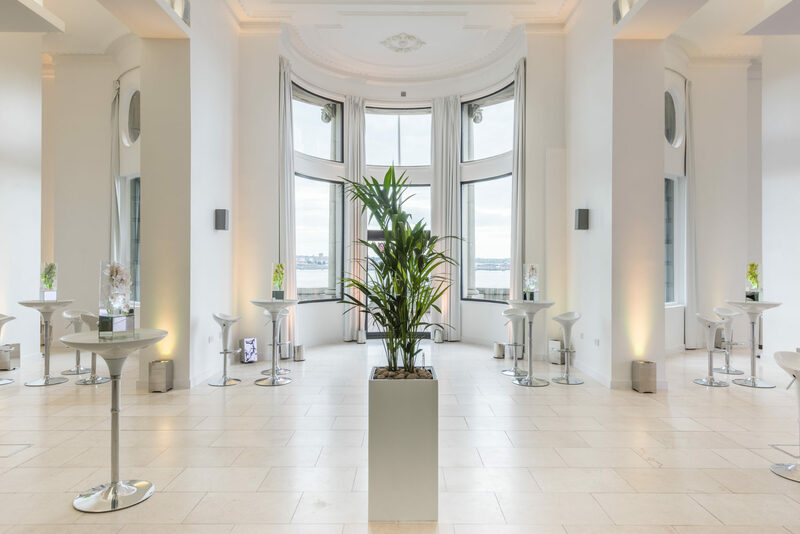 The Venue is a complete blank canvas event space suitable for hosting up to 200 people for corporate events, ideally situated on Liverpool’s world-famous Waterfront. Our fresh, white ballrooms are easily branded with any theme or colour scheme allowing your brand to take centre stage. Whether you are hosting a drinks reception or product launch, The Royal Liver Building is the perfect venue with which to align your brand. Our experienced event team are here to help with everything from planning your event to sourcing top suppliers to ensure your event is a resounding success and a memorable occasion. The Boardroom offers a traditional setting with a true wow factor, offering Waterfront views from the ninth floor of the Royal Liver Building. Available for exclusive meetings and private dinners The Boardroom is sure to impress with it’s original, luxurious features and status as one of the oldest meeting rooms in the city.